Boko Haram has released 101 of the 110 schoolgirls that the Islamist militant group abducted in Nigeria last month. The return of the girls came with a sinister warning for the girls' parents. The Nigerian government on Wednesday said 101 of the 110 girls who were kidnapped by Boko Haram Islamist militants in mid-February were returned to their hometown of Dapchi in northeastern Nigeria on Wednesday. "No ransoms were paid," said Information Minister Lai Mohammed, adding the girls were released "through back-channel efforts and with the help of some friends of the country, and it was unconditional." The girls were being treated by counselors at a local hospital and would receive psychological treatment before they returned to their schools, according to Mohammed. The family of one of the kidnapped schoolgirls told DW correspondent Adrian Kriesch in Lagos that their daughter, Aisha, had been returned. Another father told DW: "They were just brought inside the town and released. The insurgents told them just go to your homes." 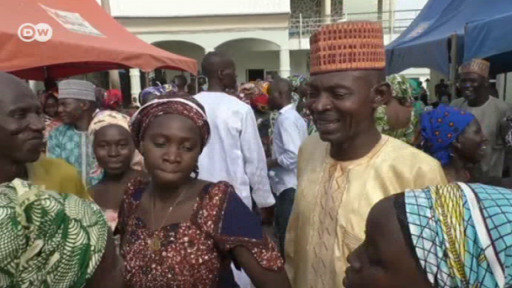 Boko Haram freed the girls "out of pity," one of the fighters told residents after a convoy of trucks dropped them off in the town. He also told residents: "Don't ever put your daughters in school again." In the local Hausa language, Boko Haram translates as "Western education is forbidden." Read more: Are Nigerian authorities withholding information on missing Dapchi schoolgirls? Nigeria's military dismissed an Amnesty International report that claimed security forces were warned several times ahead of the mass abduction last month as "outright falsehood." Amnesty had on Tuesday cited sources including security officials and witnesses who said military and police received at least five calls in the hours before the attack. The latest kidnappings caused a fresh wave of anger in Nigeria, with many people reminded of Boko Haram's abduction of 276 schoolgirls from Chibok in 2014. The February 19 case is the biggest mass abduction since the Chibok kidnappings. On 22 February, Nigerian media reported that up to 76 of the girls had been rescued, two days after they were kidnapped. Are Nigerian authorities withholding information on missing Dapchi schoolgirls?